After the Fed made the yield curve look flatter, investors can make the yield curve look inverted. The strong demand for long-term US government bonds may cause the yield curve to invert. 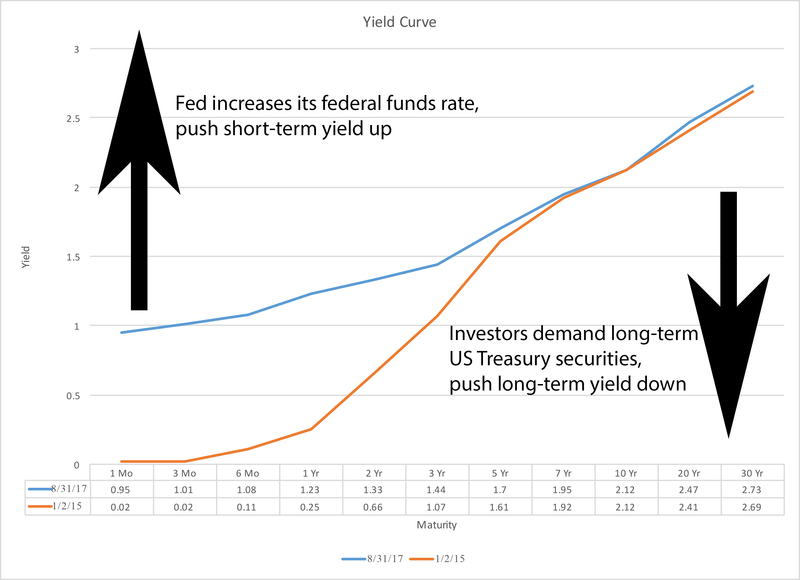 By raising short-term rates from 0.00%-0.25% to 1.00%-1.25%, the Fed made the yield curve to look flatter (see chart 1). The Fed is expected to increase its federal funds rate by another one percent before the end of 2018 making short term rate at 2.00%-2.25%. At the same time, long-term rates have been resistant to the Fed’s decisions to raise short-term rates so far. If the Fed continues to increase its federal funds rate further, the yield curve will flatten even more. This creates favorable and risky condition for the yield curve to turn negative or to invert with the help of investors. On one side, the Fed pushes short-term yields higher. On the other side, strong demand from investors pushes long-term yields lower. All inflation data: historical, current and future, shows low inflation. If we look at the most recent historical inflation data, we can see that inflation remains well below 2% target. According to the U.S. Bureau of Labor Statistics, Consumer Price Index (CPI) for all items rose 1.7% over the last 12 month ended July 2017. The CPI for all items less food and energy also rose 1.7% for the same time period. When we look at the current market data, it also shows low inflation expectations. The yields on 10 year and 30 year US Treasury bonds indicate low inflationary expectations. As of September 1, 2017 the yield on 10 year US Treasury bond was 2.15% and the yield on 30 year US Treasury bond was 2.76% (Bloomberg). The future inflation expectations remain low as well. The Federal Reserve Bank of Cleveland runs the model to estimate a future expected inflation. As of August 11, 2017, the inflation is expected to average at 1.81% for the next 10 years. As inflation remains low, the yield on long-term bonds can stay low as well. There is less of the inflation compensation built into return on the US Treasury bonds. The long-term yields can stay low due to low inflation expectations. The US long-term government bonds already offer relatively attractive rate of return. According to Bloomberg website, the yield on 30 Year US Government bonds is 2.76% (September 1, 2017). In comparison a similar UK bond yields 1.71%; German bond yields 1.16%; and the Japanese bond yield 0.81% (September 1, 2017). Based on the relative comparison, the US 30 Year Treasury bond offers attractive rate of return. Similar picture can be seen in the intermediate term structure. According to Bloomberg website, the yield on 5-year US treasury has increased from 0.72% to 1.73% over the last 5 years. Higher yield on intermediate term bonds will attract new investors, especially when other countries are paying much less for similar securities. In comparison, the UK 5 Year government bond yields only 0.44%; the German 5 Year government bond yields -0.34%; and the Japanese 5 Year government bond yields -0.16% (Bloomberg, September 1, 2017). Based on this comparison, both long and intermediate term US government debt is way more attractive than a similar debt of the UK, Germany, or Japan. 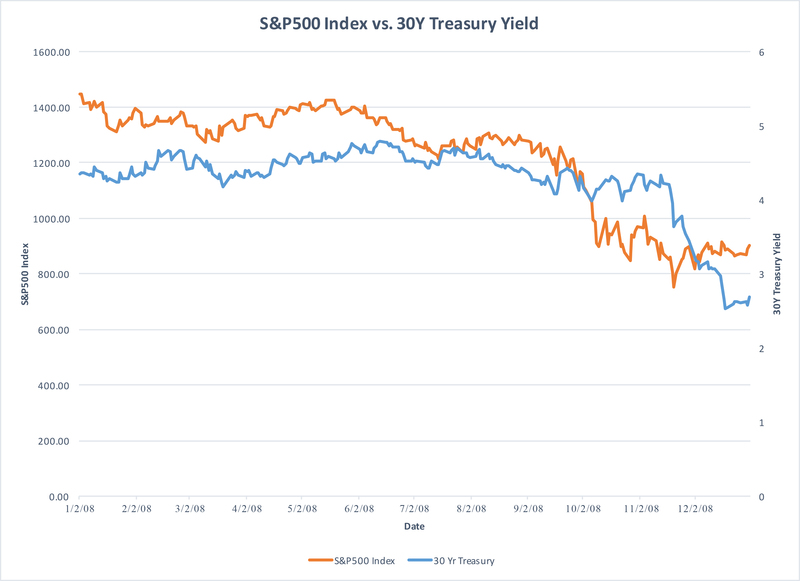 Because of a better relative return, investors should prefer the US Treasury securities causing prices to go higher and the yields to go lower. Another reason for long-term yields to decline is due to geopolitical risk. Geopolitical risk can create run for safety where investors rush to buy the US government debt. Even though, it is very difficult and almost impossible to predict what will happen next in geopolitics, having the US treasury securities as a downside protection is a smart hedging strategy against the stock market sell-off. Similar to geopolitical risk, the risk of economic recession creates the demand for long-term US government bonds. When recession is probable, investors take risk-off approach by selling equities and buying government bonds causing long-term yields to decline. For example, during the financial crisis of 2008, 30-year Treasury yield has declined from 4.67% on February 14th 2008 to 2.69% on December 31, 2008 (see Chart 2). Since the US stock market has already enjoyed more than eight years of appreciation after the financial crisis and is trading at all-time high, the economy may be due for another recession soon. When the next economic recession happens, investors will take risk-off approach and seek the safety of the US treasury debt causing the long-term yields to decline. Another strong argument for the long-term rates to stay low is demographics. According to the United States Census Bureau, the baby boomers began turning 65 years old in 2011 (May, 2014). By the year 2029, more than 20% of the US population will be over 65 years. As people approach retirement, they seek safety and interest income. Baby boomers will sell stocks and buy the US treasury securities causing bond yields to fall and prices to rise further. You can see the evidence of expected demand for fixed income in the target date funds. Since the great number of baby boomers are expected to retire by the end of 2029, the most money are invested in the 2020-2035 target dates funds. Popularity of target date funds makes the shift from equity to fixed income automatic as investors approach retirement age. Target date funds rebalance asset allocation based on a glide path. As the retirement age approaches, the fund will buy more of fixed income securities for capital preservation and to generate income in retirement. For example, somebody who plans to retire in the year 2015 may invest in American Funds 2015 Target Date Retirement Funds. This fund has the asset allocation: 50% bonds, 45% stocks, and 5% cash. American Funds target date series have about $73 billion of assets. Most popular target dates are 2020-2030, which means that the greater number of investors plan to retire in the next 3-13 years (see chart 3). As investors’ retirement date approaches, American Funds will rebalance their asset allocation to buy more fixed income securities including the US Treasury debt. 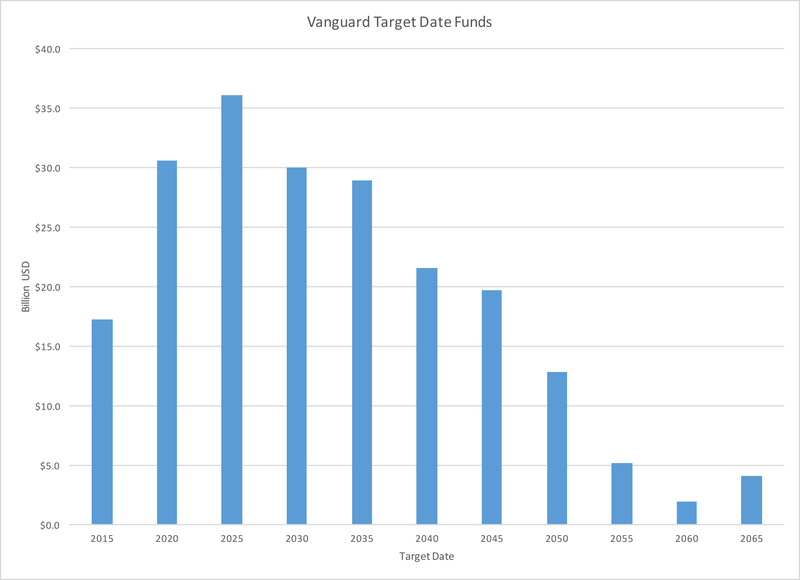 Another popular provider of target date funds is Vanguard. It also follows a similar glide path where asset allocation becomes more conservative closer to retirement. Vanguard manages about $208 billion in its target date funds. Similar to American Funds, the most money is invested in the Vanguard Target Dates 2020-2035 (see chart 4). Greater number of investors plan to retire in the next 3-18 years. 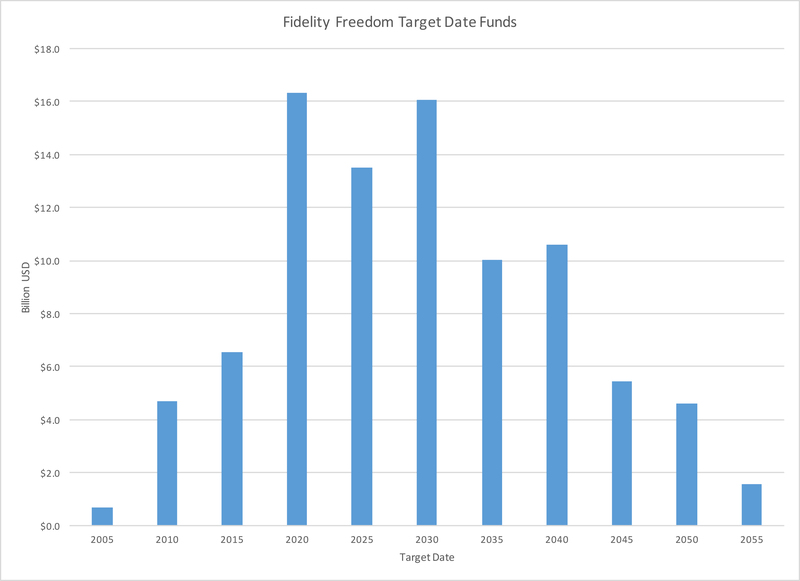 Let’s take a look at the third example of target date funds – Fidelity Freedom Funds. Fidelity has about $90 billion invested in its target date funds. As you can see from the chart 5, the most popular target dates are 2020-2030 for Fidelity Freedom funds as well. 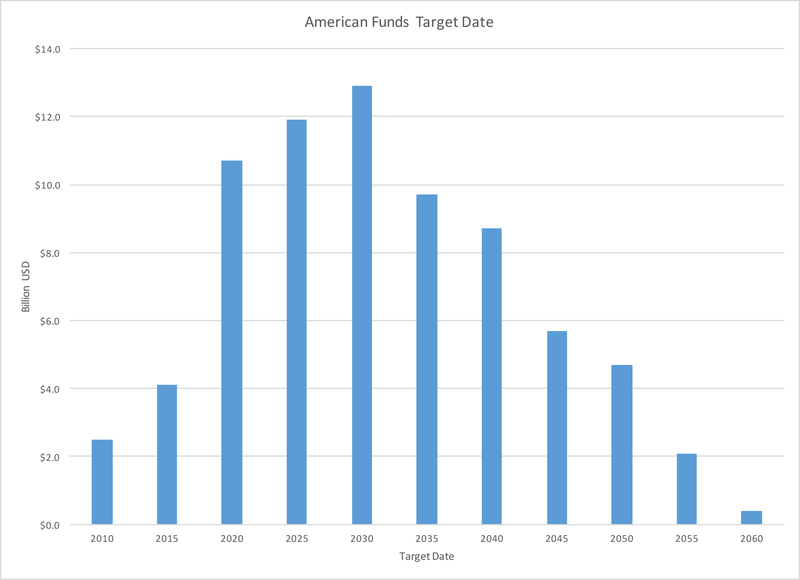 The greatest allocation of money is invested in the 2020-2035 target dates funds. It is in line with the estimate that more than 20% of the US population will be over 65 years by the end of 2029. As these investors get older, their allocation will have more fixed income and less equities. Expected increase in the demand for fixed income will cause bond prices to rise and yields to fall. The US Government bonds should see the increase in the demand because of the change in demographics and popularity of target date funds making it automatic to go from equities to fixed income. The yield curve has already flattened due to Fed’s more restrictive monetary policies. Since the Fed may continue to push short-term rates higher, the yield curve is likely to flatten even more. At the same time, economic forces and investors’ demand may push the long-term yield lower. Inflationary expectations remain low. Intermediate and long-term US government bonds already provide a relatively attractive rate of return. As geopolitical and economic risks increase, investors take risk-off approach and buy the US Treasury debt. The demand may also continue to increase with baby boomers turning 65 and demanding safe investments and fixed income. Popularity of target date funds makes the shift from equities to fixed income automatic. The most popular target date series are 2020-2035. Around 50% of all money invested in these target dates will be invested in fixed income over the next 3-18 years. The US Treasury bonds should experience the increase in demand as investors seek income and downside protection. Economic forces and investors’ demand may push long-term yield lower causing the yield curve to invert. This paper was written as an opinion only. The data is not guaranteed to be accurate or complete. Please consult with your financial advisor before making an investment decision. Investing in long-term bonds, including the US Treasury securities, exposes investors to a potential significant downside losses if interest rates do rise or credit rating gets downgraded.